Shoreline Stone was established in 2000 in Pawcatuck, CT. The company started with two employees in the stone business in a leased space of 1,000 square feet. 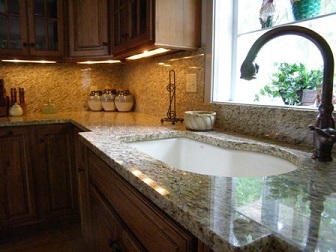 Our focus was residential custom work, primarily kitchen and bathroom vanities. Since then, we have grown in size, scope and depth. We are now a group of 25 people, occupying our own 12,000 square feet facility. We fabricate nearly 1,000 jobs annually in natural stone, quartz and Solid Surface. In the residential area we have developed a strong presence among builders of high value homes along the shores of Connecticut and Rhode Island and on the islands off the coast of these states and off New York as well. In the commercial area we have developed a strong presence in hospitals, headquarter offices and other general office buildings, in medical building complexes, national hotel chains, casinos, golf courses, and many other businesses large and small. From day one, the focus of the company has been to serve the needs of home builders, general contractors and commercial millwork companies in the Connecticut, Massachusetts and Rhode-Island tri-state area. We are proud to say that our growth has happened without ever advertising our services. Our growth have been due to the quality of our work, our customer service and our timeliness. 2001 Shoreline Stone LLC. All rights reserved.